MBARI is strategically located in Moss Landing, California, where its researchers can quickly access the deep waters of the Monterey Canyon. Made famous by John Steinbeck’s classic novel Cannery Row, Monterey Bay is the ocean equivalent of the Grand Canyon and it provides unprecedented access to the deep sea. Thanks to the geology of the region—a steep drop-off to near-abyssal depths within 100 kilometers (about 60 miles) offshore—the deep is very close. In less than three hours, scientists can be exploring the seafloor nearly a thousand meters below the surface with Doc Ricketts and Ventana—MBARI’s remotely operated vehicles (ROV). In just eight hours, scientists can be exploring the abyssal plain at a depth of almost three kilometers (two miles). The institute operates two research vessels, the R/V Western Flyer for longer multi-day expeditions and the R/V Rachel Carson mainly for one-day trips out to sea, with occasional longer missions to conduct seafloor mapping. MBARI teams also collaborate with other institutions aboard ships operated by academic and government organizations around the world. Researchers are very busy during these expeditions, often multi-tasking various science and engineering activities to accomplish their goals within a few days. 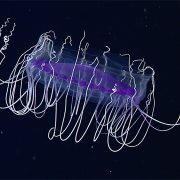 These cruise logs provide a glimpse into what goes on during an MBARI expedition and what our researchers are doing to help answer important science questions. March 8-14, 2019 – The Midwater Ecology Group is measuring oxygen consumption rates of select deep-sea animals using a custom-designed tool, the Midwater Respirometry System (MRS). 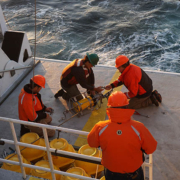 February 4 to 14, 2019 – MBARI's Geological Changes group is investigating the activity of submarine channels, gullies, and pockmarks as well as beginning to conduct post-lay impacts of submarine telecommunications cables.